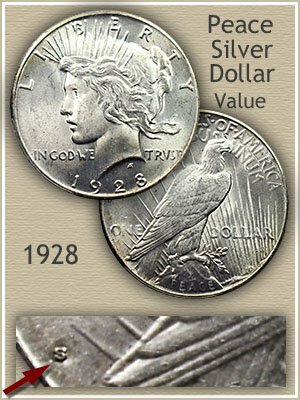 A rare year, 1928 Peace silver dollar value starts at $24.95 for those struck at the San Francisco mint. However a quick look at the value chart shows the Philadelphia issue is exceptionally scarce. Determining the mint that struck your coin is a matter of locating the presence of a mintmark on the reverse. Refer to the image just below with its close-up view highlighting placement of mintmarks on Peace dollars. 1928 was a very low production year at Philadelphia resulting in today's small number of available silver dollars. Another major contributor to value is the condition of your coin. Premiums are paid by collectors and dealers when a silver dollar has survived in above average preservation. These coins are very liquid (easy to sell for strong prices) in the collectible market. Pictured is an example of a desirable silver dollar. It is the quality that quickly finds a home in an advanced collection. This coin still remains "uncirculated" in condition, no wear to its surface. A rare condition for any 1928 Peace dollar and one desired by many collectors. See the section on "grading silver dollars" further down and compare your coin to find it full value. Two mints struck silver dollars in 1928, Philadelphia the main mint and San Francisco the branch mint in California. To identify their production San Francisco placed a small "S" on the reverse. Since Philadelphia did not use a mintmark at the time, the rare 1928 silver dollar is without a mintmark. Just above the eagle's tail, close to the rim is where you find mintmarks. Note: they are small. A larger numbers of collectors are perusing collections of Peace Dollars. Their focus is on top condition examples of all dates and mints. One date - 1928 is especially elusive when "gem" quality is desired for inclusion into a collection. Few of the 1928 Peace dollars minted at Philadelphia remain with undisturbed, original, bright mint luster. Most now have evidence of wear and are marred by marks and abrasions. When a true gem example of these elusive coins is offered for sale it draws the attention of serious, avid collectors. David Lawrence Rare Coin Auctions featured a very nice 1928 dollar and was met with strong demand. Bidding continued to a high of $2100. Pristine surfaces and "booming" luster, which is rarely encountered, sets this coin apart, both in quality and value. Without a doubt 1928 is a special year to the collecting community. Your coin is easily marketed to a large collector base. 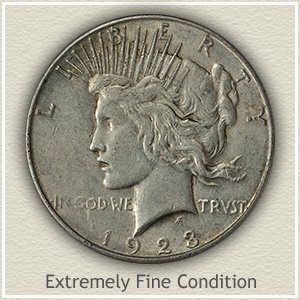 Take your time judging the condition of your silver dollar it is critical to accurately determining value. Although a certain degree of subjectivity is involved, by following the images and descriptions you get a good idea of the process. Degrees of wear are categorized into "grades" representing the different values on the chart above. 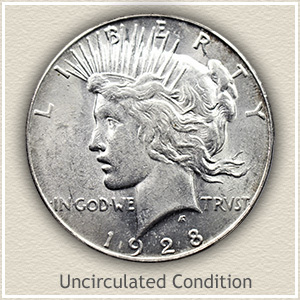 Uncirculated: A 1928 Peace silver dollar in "uncirculated" condition is a scarce and valuable coin. No wear to the surfaces is what sets this coin apart. Additionally, original mint luster is still present on the surfaces. To confirm the uncirculated condition, hold your coin at an angle to a light source, when tilted side to side "luster" rotates over the designs. Liberty's cheek and hair are the highest parts of the design and even a short time in circulation removes the delicate luster leaving these areas dull. 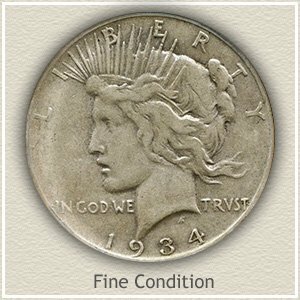 Extremely Fine: 1928 Peace silver dollar value in "extremely fine" condition is a highly sought coin. Only very light wear is acceptable for this grade and limited to the very highest parts of the design. A distinct fullness with rounded features to the hair must remain. The tie of hair at the back is still bold with only minimal merging of detail. Fine: Wear has smoothed and reduced metal over all parts of design. If reduction of design is not to severe your coin is in "fine" condition. Detail within the hair is still visible, major strands are still separated, although the finer strands have merged. Liberty's cheek and neck now displays a few areas of flatness. On the reverse the feathers of the eagle lack detail with only three lines separating the different layers of wing feathers. Good: Wide areas of heavy wear is evident, and a merging of the hairline with the neck, designates your coin as "good" condition. 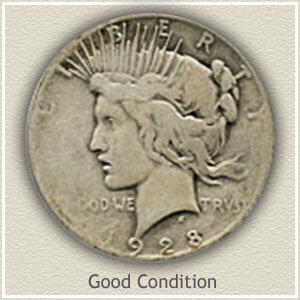 Although "good" is a comparatively low grade, 1928 Peace silver dollars both the Philadelphia and San Francisco issues are collectible. On the reverse, the eagle is well outlined, however most feather detail is now missing. Values of your Peace silver dollars are influenced by both an active collector market and as a silver bullion coin. Your coins are very liquid and easily sold for strong prices. Determine from the chart, all the dates and mints highly valued by collectors, and current bullion value of the ones moving with the silver market. 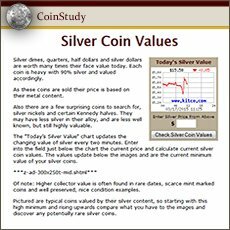 Find accurate Silver Dollar values using the coin value chart, separate the common from the rare. Listing the early Bust and Seated Liberty Dollars to Morgan and Peace silver dollars. Rising silver prices, increasing demand from both collectors and rare coin dealers requires a second look at your box of old coins.